Product information "SEGGER 8.20.00 - J-Trace PRO Cortex"
""J-Trace PRO Cortex provides support for Cortex-A/R/M based microcontrollers. The SuperSpeed USB 3.0 interface of J-Trace PRO Cortex enables continuous streaming trace via USB with the full trace clock, lifting the limitations by internal buffers and slow data transmission to give you all the insights you need to develop and optimize your code. 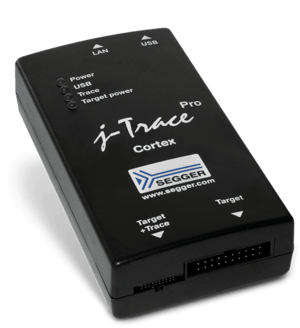 Related links to "SEGGER 8.20.00 - J-Trace PRO Cortex"
Customer evaluation for "SEGGER 8.20.00 - J-Trace PRO Cortex"